SCVHistory.com LW3256 | Film-Arts | Stars Share Spotlight as Cowboy Festival Turns 25. Stars Share Spotlight as Cowboy Festival Turns 25. SCVNews.com | April 21, 2018. 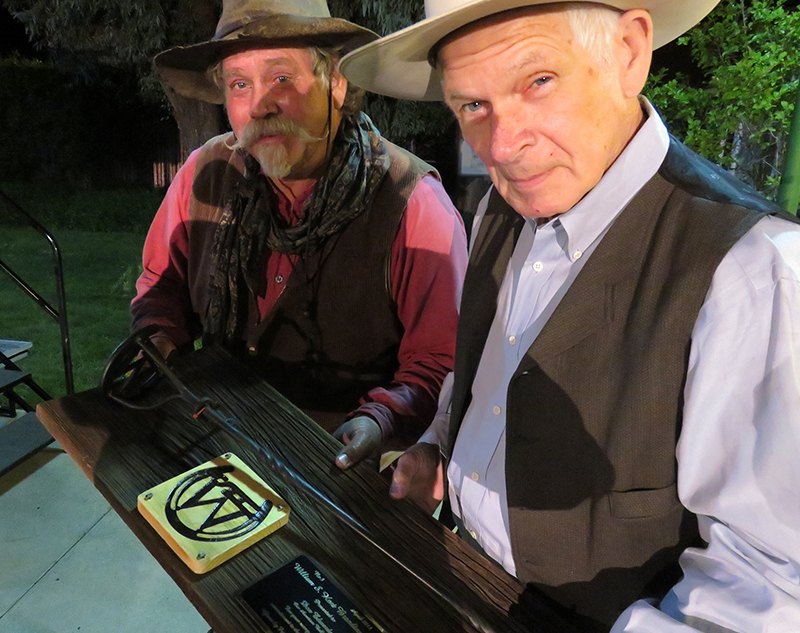 Cowboy crooner Don Edwards (right) gets a look at his new William S. Hart branding iron, fabricated by blacksmith Brian Jones (left). Click to enlarge. Veterans of the Santa Clarita Cowboy Festival stage were honored Saturday night as the city celebrated the festival's silver anniversary at William S. Hart Park in Newhall. Highlight of the evening was the presentation of branding irons bearing Hart's monogram to eight performers, some of whom have entertained local crowds almost since the beginning of the festival in 1994. The branding irons were fabricated for the occasion by Brian Jones, a blacksmith from Calico, and presented by Mayor Laurene Weste on behalf of the Friends of Hart Park. The criteria was that each had performed more than once in the Hart Mansion for the benefit of the park and museum. On hand to receive the awards were singers Don Edwards, Lon Hannah of the Sons of the San Joaquin, Belinda Gail, Dave Stamey, R.W. Hampton, Jon Chandler and Wylie Gustafson (known outside of the cowboy music genre for the "Yahoooo" of the search engine's TV commercial). The eighth Hart brand went to Wyatt Earp, great-grandnephew of the famous lawman, who was a friend of Bill Hart. The younger Earp portrays his namesake ancestor in a one-man play written by his wife, Terry. 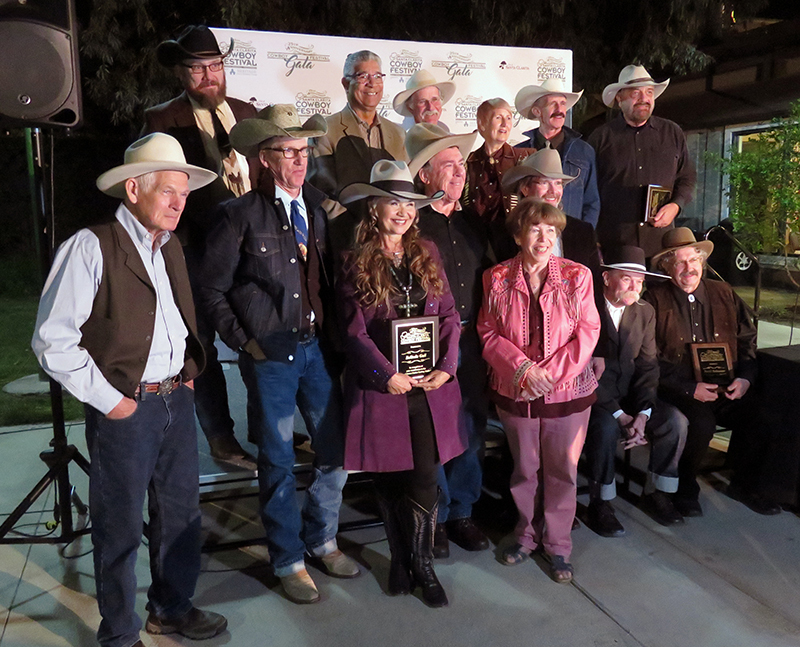 Emceed by Ed Masterson with entertainment by rising cowboy music stars Kristyn Harris and Mikki Daniel, the evening included a retrospective on all past recipients of the Newhall Walk of Western Stars award, which was not given out this year. The brainchild of former City Manager Ken Pulskamp, the Santa Clarita Cowboy Festival was originally scheduled for the Hart High Auditorium. But just then, the 1994 Northridge Earthquake put a hitch in the gitalong. The Veluzat family stepped in, offering up the historic Melody Ranch Motion Picture Studio in Placerita Canyon, and the festival was off and running. In 2015, with Melody Ranch under exclusive contract for HBO's "Westworld," the festival switched to another historic Western venue, the home of cowboy actor William S. Hart. The 25th annual Santa Clarita Cowboy Festival continues today with performances starting at 10:45 a.m. The lineup includes a mixture of "locals" and national headliners (and locals who are national headliners). For the complete schedule, visit CowboyFestival.org. Admission is free. Park at 13th Street and take the shuttle. "Come for the cobbler, stay for the music." Longtime Cowboy Festival performers with Mayor and Council members Laurene Weste, Marsha McLean and Bill Miranda.